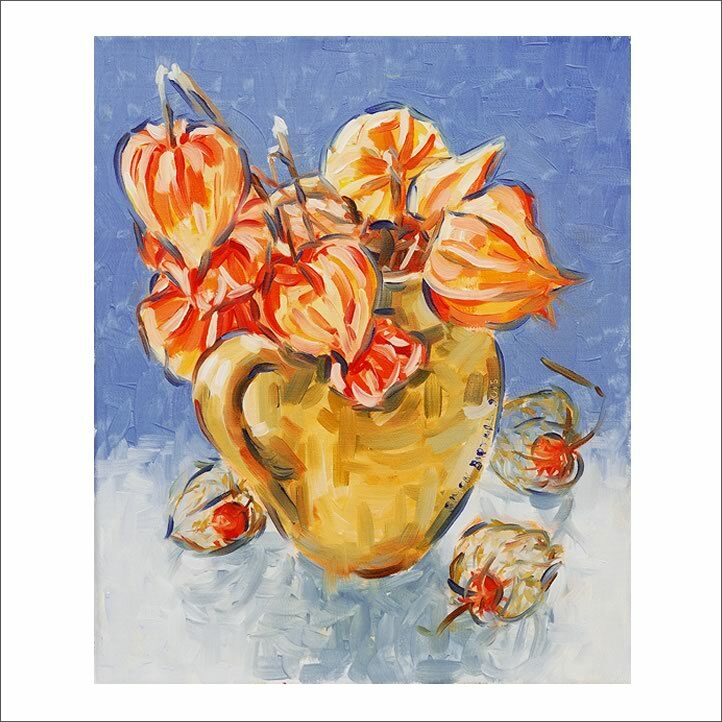 Artwork title: Still Life with Chinese Lantern Husks and Ewer | Artwork media: Oils | Artwork dimensions: 30.3 x 25.3 cm (12″ x 10″) approx. Simon Birtall originally trained in illustration at Falmouth School of Art in the early 1990s, and has since diversified into still life, landscape and portrait art. Simon Birtall: “I take inspiration from any source, be it a designated piece of ‘art’ or otherwise, traditional or modern. My painting technique is thus under constant development. The initial (and perhaps most significant) influences upon my work were the Impressionists and Post Impressionists. Colour theory is fundamental to my working process; paint is often applied in small brushstrokes in order to create optical vibrations of colour. Painting in oils or acrylics, I seek to imbue my work with a sense of spontaneity. I favour subjects that offer the opportunity to enjoy explorations of colour. My recent work concentrates on the study of still life subjects from life, and embraces experiments in the use of alternative surfaces to canvas such as recycled packaging. Since 2002 I have run a successful ‘Portraits from Photographs’ service, painting or drawing portraits of family, friends or pets from photos. I also run painting workshops. These workshops offer step-by-step tuition in an informal, friendly atmosphere.